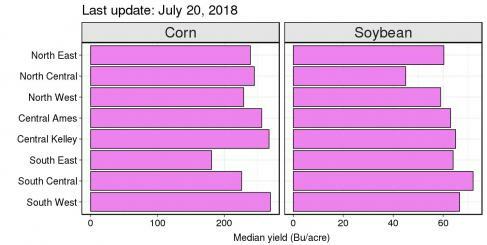 Our analysis shows that soybean more has been more adversely affected by the 2018 weather compared to corn. Soybean yield potential has dropped while corn yield potential is still high. We are in the midst of critical corn grain filling now and soybean grain filling will be starting soon. Convergence in the best and worst case scenarios will begin to occur as grain filling continues. 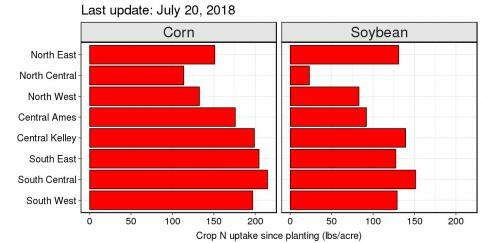 Nitrogen uptake by the corn plant has peaked and nitrogen uptake rates are now approximately 1 pound per acre per day. In the central IA sites you can see the magnitude of nitrogen leaching from the top layer to the bottom. And in the northern Iowa sites you can see the effect of heat on nitrogen accumulation. Overall this analysis revealed that the 2018 is very unique as it falls outside the historical average. 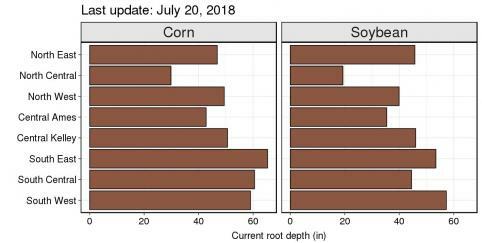 Interestingly, root depths at the central Iowa site are about 4 feet. This is much shallower than they should be at that time of the year. The reason for shallow root depths is the presence of shallower water tables and the lack of rooting ability into saturated soils with limited oxygen. A change to the FACTS webpage have been made. The soil water and nitrogen and plant water and nitrogen uptake figures now include historical benchmarks. This baseline will help compare the current growing season with the long-term average (or normal year). And evapotranspiration, rooting depth, and soil nitrate status per layer are now included on the summary page. For more information go to crops.extension.iastate.edu/facts.